When you love the look of wood but need to cut expenses, discount wood flooring makes a great option. With careful research, you may be able to save thousands of dollars on your new floor without cutting quality at all. How Does Discount Flooring Save You Money? Discount wood flooring companies are able to save money several ways. They are often able to buy flooring in huge quantities and as a result get it less expensively from the manufacturer. Sometimes they buy close-out merchandise, flooring that is being discontinued. In some cases, the flooring company will buy unsold back stock from retailers who need to make room for new shipments. Often these discount companies have fewer employees, a less fancy store, or cut costs in other ways, allowing them to pass on savings to the customer. This wood flooring is priced less than the very same flooring would be sold for in conventional retail markets. However, the variety of selection is often less, so it works best if you are flexible. You will also need to either install the floor yourself or find a contractor. Most discount flooring companies do not offer installation services. To find companies near you that specialize in discount flooring, try doing a search on your favorite web search engine with the term discount wood flooring along with your city or state. This will give you an idea of what is available to you locally. The benefit of buying locally is that you can actually see and touch the flooring products available. This provides a clear idea of the exact color and texture of the wood as well as the quality. You may even be able to bring a sample home to see what it looks like in your house. As an additional savings, you'll more than likely save on shipping costs, too. While customers enjoy these benefits, it's important to look at the negative side of things. When buying locally, unless you have a large discount flooring store nearby, there may be fewer styles and colors to choose from. Shopping in person can mean that you will feel pressured into buying something you may not be totally certain you like. It is a good rule of thumb to choose your flooring and then wait for a day or two before buying it to give you time to be sure it is what you are looking for. You may find that someone has purchased the wrong flooring, or is selling vintage flooring at far less than the cost of new wood floors. 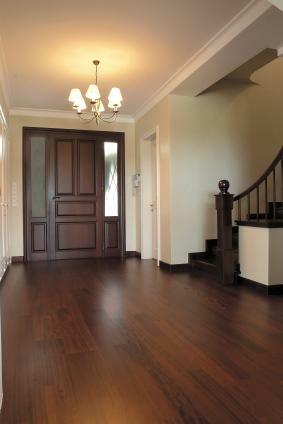 There are hundreds of discount flooring companies on the internet that specialize in wood floors. These companies often have a larger selection of wood flooring styles than the local companies, and many offer free shipping on large purchases. Always double check the return policies and other company details so that you understand what you are getting and what sort of guarantee you have. Build Direct has hundreds of styles, finishes, and colors of discount wood floors in stock, including bamboo. Because the company does such a large volume, prices for premium quality wood flooring is significantly lower than retail. They also ship worldwide. You may return the flooring within 30 days for a full refund, and shipping is free on returns. The company accepts credit cards, Paypal, money orders, wire transfers, and has a "bill me later" option as well. Build Direct does allow you to order samples of the flooring you are interested in, charging only for the courier service. Save money with discount wood floors. Fast Floors is an authorized factory dealer. This is important, because if you buy from a company that has not been authorized by the manufacturer any warranty may be voided. This company has been in business since 1977 and offers several styles of flooring. While buying discounted flooring is a great way to save money, it is important that you read all the information about the company, as well as make sure that you understand shipping policies, return policies, and other company specifics. By doing your homework, you can safely achieve a beautiful wood floor for much less money.